I was outside gardening without gloves the other day, taking care of weeds, when a prickly plant stung and left me with a troublesome rash. It turns out that it was stinging nettle. You could also call it the gloveless gardener’s worst nightmare. The thing is, the plant doesn’t have thorns that are obvious to the eye. Instead, there are nearly invisible fine hairs that look innocent, but they aren’t. That being said, if you can look past the temporary discomfort of its sting, you can grow to appreciate the many health benefits of stinging nettle—also called Urtica dioica. The perennial flowering plant has been used as medicine since the days of Ancient Greece. Today, perhaps its most common use is stinging nettle tea, especially as a natural remedy for allergies. However, the benefits and uses don’t end there. Read on to discover why this nettle stings, along with the various reasons why it should be included in your medicine cabinet. Since Stone Age times, stinging nettle has been used to make textiles like paper and cloth. The fiber in nettle is hollow, and therefore provides natural insulation. In fact, the German army used stinging nettle for uniforms in World War I. The mythology of stinging nettle has also served as a common feature of many belief systems across time. The legend often revolves around a figure suffering a sting in silence, refusing to scratch the area. 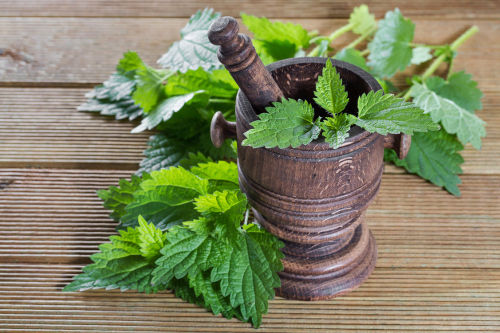 In Ancient Greece, physicians Dioscorides and Galen used nettles as a laxative and diuretic. It was also reportedly used as a diuretic and natural joint pain reduction remedy in Europe during the Middle Ages, and treated certain diseases with urtication—a process where beating the skin with nettles would stimulate blood circulation. Today, stinging nettle grows throughout the world with its origins in the colder regions of Asia and Europe. Stinging nettle is also quite the nutritional powerhouse that, when processed, has a number of important health benefits. It’s loaded with fiber, protein, phenolic compounds, fat, tannins, carotenoids, and antioxidants. As a result, some of the reported stinging nettle health benefits include treating kidney disorders, reducing menstrual flow, treating hemorrhoids, stimulating contractions in pregnant women, stimulating hair growth, promoting lactation, providing relief from water retention, preventing diarrhea, providing asthma relief, and treating anemia and tendonitis. Let’s take a look at some of the more prominent health benefits of stinging nettle. Benign prostatic hyperplasia (BPH) is the medical term commonly known as an enlarged prostate. It often occurs in middle-aged men, and the main cause is hormonal changes linked with aging. Symptoms include frequent urination, painful urination, incomplete emptying of the bladder, reduced urinary flow, and post urination dripping. Studies find that stinging nettle can help relieve BPH symptoms due to nettle chemicals that affect hormones that lead to BPH. A study published in the journal Planta Medicine in 2000 also found that stinging nettle root extract can stop or slow the spread of prostate cancer cells. The root of stinging nettle is often combined with saw palmetto and other herbs for urinary issues. As a diuretic stinging nettle can also help increase urine flow. Stinging nettle is a well-known natural allergy remedy. Hay fever (allergic rhinitis) will often produce uncomfortable symptoms such as sneezing, runny nose, congestion, itchy skin, and fatigue. The anti-inflammatory properties of stinging nettle affect key enzymes and receptors in allergic reactions to help prevent hay fever symptoms. It would seem that the histamine in stinging nettle would be counterproductive in an allergy treatment; however, research does suggest that histamines can treat severe allergic reactions. A randomized, double-blind study published in the journal Planta Medica in 1990 also found that stinging nettle was considered better than the placebo for allergy relief. Research also shows that stinging nettle is an effective remedy for high blood pressure, according to a 2002 study published in the journal Phytotherapy Research. Another 2006 study from the same journal supported the ability of stinging nettle to prevent and treat cardiovascular disease. Osteoarthritis affects 80% of the American population over 50 years old. Joint pain is common among arthritis sufferers, especially in the knees, hips, hands, and spine. Stinging nettle could combine with NSAIDs (non-steroidal anti-inflammatory drugs) to help treat joint pain, which may allow patients to decrease the use of drug at the same time. Studies show that nettle could provide pain relief when taken orally or topically. Research in the Journal of Rheumatology also shows stinging nettle can treat autoimmune diseases such as rheumatoid arthritis. A product called Ankaferd blood stopper contains stinging nettle, common grape vine, thyme, licorice, and alpinia. A study published in the Journal of Contemporary and Dental Practice in 2010 found that Ankaferd blood stopper reduces bleeding after dental surgery when applied to the skin. Stinging nettle also does an excellent job accelerating skin healing and preventing infection when a burn has occurred. A study published in the World Journal of Plastic Surgery in 2015 found that stinging nettle was more effective than traditional burn treatments Vaseline and silver sulfadiazine. Eczema is characterized as dry and swollen, itchy rash that can sometimes cause blisters that can crust over. The anti-inflammatory and antihistamine qualities of stinging nettle make it a natural treatment for inflammatory conditions like eczema, as stated in the American Journal of Contact Dermatitis in 2003. Taken orally, stinging nettle can help treat eczema internally, while a nettle cream can also help provide relief from the rash. It is estimated that 1.7 billion in the world suffer from blood sugar problems. Research shows that IL-6 (interleukin-6) plays a major factor in Type 2 diabetes. A randomized double-blind, eight-week study published in the Pakistan Journal of Biological Sciences in 2011 found that stinging nettle can significantly reduce IL-6 levels in 50 Type 2 diabetics compared with a control group. Stinging nettle has heart-shaped leaves, grows between two to four feet, and produces pink or yellow flowers. Nettle grows best in nitrogen-rich soil, and often blooms between June and September. You may also see stinging nettle being sold at some farmers markets in May, as it is often harvested in spring. It is possible to purchase stinging nettle products from local health food stores, or you can harvest nettle yourself. The leaves and stem make most stinging nettle products; however the roots also have some medicinal qualities. Before making or purchasing stinging nettle it is best to determine whether the roots or the stem and leaves are needed for your particular health problem. Stinging nettle products are available in dried or freeze-dried leaf form, root tinctures, capsules, tablets, extracts, juices, and teas. Stinging nettle extract and root tinctures can be used on joints or painful areas of the body. Topical stinging nettle also comes as a cream. There are varying degrees of active ingredients in stinging nettle products; therefore, it best to work with a doctor to determine the right dosage. The dried stinging nettle leaves and flowers can be steeped into a tea, and some recipes will feature other herbs like goldenseal, raspberry leaf, and echinacea. It is also possible to cook with stinging nettle is similar way to spinach. Once cooked it can be added to soups or stews. Other recipes that call for nettle include pesto, green smoothies, polenta, and salads. What Makes Stinging Nettle Sting? Stinging nettle is exactly why gardening with gloves is important. The fine hairs, or trichomes, on the stems and leaves of stinging nettle contain a number of chemicals that are released when the plant contacts the skin. Some of these potentially irritating chemicals include histamine, acetylcholine, oxalic acid, tartaric acid, formic acid, and serotonin. When brushed up against, the fragile silica tips of the hair breaks off and the hair acts like a needle that pierces the skin, and causes the chemicals to be injected into the skin. As a result, symptoms can include redness, itching, swelling, numbness, and pain. If you are stung by stinging nettle, do not scratch or touch the affected area, as this will only extend the irritation for days. The chemical irritants can be dried on the skin, and removed with soap and water. Duct tape can also help remove additional nettle hairs. Other plants that can provide relief from the sting include sage, jewelweed, and also stinging nettle themselves when dried or cooked or soaked in water. You remove the stinging quality as a result. Cold compresses, calamine lotion, or aloe vera can help relieve the itch as well. When used appropriately, stinging nettle is generally safe; however, there are a few precautions to consider before using nettle. When harvesting, always wear gloves to avoid being stung. When taking stinging nettle herbal supplements for medicinal purposes, it is wise to do so under the guidance of a health care provider. Also, speak to your doctor before using stinging nettle if you are pregnant or a diabetic. Nettle may affect the strength of diabetes drugs and increase hypoglycemia risk. Other medications that may interact with stinging nettle include diuretics and water pills, lithium, NSAIDs, high blood pressure drugs, blood thinners, and sedative medications. It is also important to note that when first taking stinging nettle, some people may experience diarrhea, upset stomach, or other mild reactions. As a result, it is a good idea to ease into use with small doses. “11 Amazing Benefits of Stinging Nettle,” Organic Facts; https://www.organicfacts.net/health-benefits/herbs-and-spices/stinging-nettle.html, last accessed May 12, 2017. “The Many Stinging Nettle Benefits,” Mother Earth News; http://www.motherearthnews.com/natural-health/stinging-nettle-benefits-zmaz81mazkin, last accessed May 12, 2017. “Stinging nettle,” University of Maryland Medical Center http://www.umm.edu/health/medical/altmed/herb/stinging-nettle, last accessed May 12, 2017. “7 Proven Stinging Nettle Benefits,” Whole New Mom; https://wholenewmom.com/health-concerns/benefits-of-stinging-nettle/, last accessed May 12, 2017. Konrad, L., et al., “Antiproliferative effect on human prostate cancer cells by a stinging nettle root (Urtica dioica) extract,” Planta Medica, February 2000; 66(1): 44-47. https://www.ncbi.nlm.nih.gov/pubmed/10705733. Roschek, B., et al. “Nettle extract (Urtica dioica) affects key receptors and enzymes associated with allergic rhinitis,” Phytotherapy Research, July 2009; 23(7): 920-926, doi: 10.1002/ptr.2763. Zimmermann, I., et al., “Effect of Intravenous Histamine, Allergen (Ascaris suum Extract) and Compound 48/80 and Inhaled Allergen-Aerosol on Bronchoconstriction and Histamine Release,” Respiration, 1891; 42: 30-42, doi: 10.1159/000194401. Mittman, P., “Randomized, double-blind study of freeze-dried Urtica dioica in the treatment of allergic rhinitis,” Planta Medica, Feb. 1, 1990, 56(1): 44-47. http://europepmc.org/abstract/med/2192379. Legssyer, A., et al., “Cardiovascular effects of Urtica dioica L. in isolated rat heart and aorta,” Phytotherapy Research, September 2002; 16(6): 503-507. https://www.ncbi.nlm.nih.gov/pubmed/12237804. El Haouari, M., et al., “Inhibition of rat platelet aggregation by Urtica dioica leaves extracts,” Phytotherapy Research, July 2006; 20(7): 568-572. https://www.ncbi.nlm.nih.gov/pubmed/16619332. Klingelhoefer, S., et al., “Antirheumatic effect of IDS 23, a stinging nettle leaf extract, on in vitro expression of T helper cytokines,” Journal of Rheumatology, December 1999; 26(12): 2517-2522. https://www.ncbi.nlm.nih.gov/pubmed/10606356. Baykul, T., et al., “Use of Ankaferd Blood Stopper as a hemostatis agent: a clinical experience,” Journal of Contemporary and Dental Practice, Jan. 1, 2010; 11(1): E088-94. https://www.ncbi.nlm.nih.gov/pubmed/20098971. Akbari, H., et al., “The Healing Effect of Nettle Extract on Second Degree Burn Wounds,” World Journal of Plastic Surgery, January 2015; 4(1): 23-28. https://www.ncbi.nlm.nih.gov/pmc/articles/PMC4298861/. Anderson, B.E., et al., “Stinging nettle dermatitis,” American Journal of Contact Dermatitis, March 2003; 14(1): 44-46. https://www.ncbi.nlm.nih.gov/pubmed/14744424. Hoene, M., et al., “The role of interleukin-6 in insulin resistance, body fat distribution and energy balance,” Obesity Reviews, January 2008; 9(1): 20-29. https://www.ncbi.nlm.nih.gov/pubmed/17956545. Namazi, N., et al., “The effect of hydro alcoholic Nettle (Urtica dioica) extracts on insulin sensitivity and some inflammatory indicators in patients with type 2 diabetes: a randomized double-blind control trial,” Pakistan Journal of Biological Sciences, Aug. 1, 2011; 14(15): 775-779. https://www.ncbi.nlm.nih.gov/pubmed/22303583.